If you are a startup in the IIoT industry, add or edit your profile directly at the CB Insights Editor to get in front of our research team. So far, the IIoT wave transforming asset-heavy industries has been led by the old guard of tech giants such as GE, IBM, and Cisco. With connected devices like Nest and Sonos breaking into the mainstream, the IoT has become one of the most-discussed tech trends of the last twenty years. But the IoT extends well beyond the home and consumer-level gadgets. Asset-heavy industries like manufacturing, logistics, mining, oil, utilities and agriculture have also begun to apply IoT systems to improve efficiency and results. With machines and specialized sensors collecting data at every step of production, the potential gains from the Industrial Internet of Things (IIoT) are enormous. Just in 2016 alone, startups bringing digitization to industry saw more than $2.2B of investment. Large corporates have also been involved in M&A in the space. Recently, General Electric, for example, acquired IoT platforms Bit Stew Systems and Nurego, in addition to two large 3D printing acquisitions this past fall. Learn about the trends and technologies disrupting advanced manufacturing and what to watch in 2019. So far, the IIoT wave has been led by the old guard of industrial tech companies such as GE, IBM, and Cisco, who envision the IIoT as a core component of their future businesses. GE, in particular, pioneered the term “Industrial Internet” when announcing its $1.5B R&D commitment back in 2012. But more and more startups are attacking the needs of heavy industry by developing sensors, cloud platforms, networking infrastructure, as well as machine learning software to extract insights from the deluge of data. Using CB Insights data, we mapped out the startup landscape within IIoT, with a new approach that categorizes companies by where they sit in the tech “stack,” starting from hardware all the way down to AI-powered analytics. Note: While some companies may fit into multiple categories and parts of the stack, we mapped companies based on their primary use-case. This market map is not meant to be exhaustive of companies in the space. Click to enlarge. Connectivity — wireless network providers like SigFox and Ingenu act as the telecoms for the IoT age. Most companies here provide LPWAN (low-power wide area network) connectivity, which is popular radio band for IoT devices because existing cellular systems aren’t power- and bandwidth-efficient enough for systems sending small packets of data. Some, like Senet use the LoRaWAN spectrum, and others like SigFox work with ultra-narrowband specifically for low-power devices. Sensors & Monitoring — some companies in this area are solely sensor or system on chip (SoC) makers like Ineda Systems, but the category also includes more “full stack” (but industry agnostic) sensor and monitoring platforms like Samsara, Helium, and Electric Imp. M2M / Satellite — sometimes Industrial IoT assets operate in rural and less connected parts of the world. Satellites can be a more effective way for sensors to transmit data, and companies like Kepler Communications offer a space-based communication network. With similar advantages in isolated industrial environments, machine-to-machine (M2M) communication is a more decentralized way to pass information between devices, and companies like Filament are applying blockchain architecture to do so with low-power industrial sensors. Inspection Drones — startups offering drone hardware or image analysis services for industrial inspection. Some startups like Skycatch have individual use cases, such as construction. Recently, drone makers famous for their consumer drones like 3D Robotics have moved into the inspection space. While it’s mostly aerial drones for now, the category encompasses all types including underwater drones and pipe inspecting drones such as those made by RedZone Robotics. 3D Printing — leveraging materials science and robotics, companies like Desktop Metal and Carbon 3D are bringing the customization benefits of 3D printing to an industrial scale. 3D printing tech is starting to go beyond just prototyping tools to being production-scale for making parts, which is why corporate venture arms of GE and BMW are investing here. Industrial AR/VR — headsets and mobile AR specifically tailored for industrial settings and field service. Daqri and Atheer are well-funded headset makers that focus on enterprise and industrial settings. Others like Scope AR do similar work in field service using mobile and tablets, employing AR to highlight parts on industrial equipment while connected to support experts in real-time. Wearables — IoT sensors worn on the body in industrial environments. Strong Arm Technologies makes a safety wearable and some industrial smartglass makers like Ubimax and Upskill also have wearables offerings. Robotics & Exo — industrial automation robots along with exoskeletons that augment human abilities. Companies like Rethink and Righthand Robotics both make the classic arm-shaped industrial robots for manufacturing. Clearpath Robotics does warehouse robotics, as well as a host of ruggedized ground and sea-faring drones. And companies like Kindred and Sarcos are developing worker exoskeletons that can help handle heavy materials or be remotely operated for inspections. Universal Platforms — cloud vendors here commonly market themselves as general platform-as-a-service (PaaS) companies that allow other IoT and IIoT companies to manage and maintain the capture of data from their device networks. This includes the mostly industry-agnostic platforms like C3 IoT and Altizon that do cloud analytics for industrial companies. Fog & Edge Computing — computing done at the “edge” or closer to the sensor is a trending shift occurring within the IIoT architecture. Companies like Saguna Networks do edge computing (close to the point of collection), whereas a company like Foghorn Systems does fog computing (think a lower-hanging cloud that’s done on-site like a LAN). Both methods allow mission-critical devices to operate safely without latency of transmitting all data to a cloud, which can also save big on bandwidth. Fleet — sensor networks and solutions for connected trucking fleets. Companies like Veniam are focused on the connectivity aspect, where others like Vnomics sell optimization and vehicle monitoring technology. Oil & Gas — companies using connected sensor networks in the oil industry include GroundMetrics (locating wells), Tachyus (extracting oil and gas), and Aptomar (spill safety). Agriculture — companies like Blue River Technology and Farmbot are bringing robotics to agriculture. Others like Farmers Edge and Terravion are about capturing and analyzing farm data and tractor telematics for more efficient production. Smart Grid – startups in this area develop tech that enables more efficient distribution of electricity, gas and water, and often market to utility companies. Trilliant, Tendril, and BluePillar are smart-meter enabled solutions for utilities and large enterprises to manage usage and reporting. Factory — Eigen Innovations and the companies in this category are more vertical-specific platforms for manufacturing analytics. Eigen, for example, uses video and sensor data on factory floors to ensure process and quality control. Warehouse — robotic movers and RFID sensor systems that target the warehouse. Fetch Robotics, for example, does material transport on warehouse floors. Alien Technologies, one of the most well-funded startups in all of IoT, does RFID tagging tech for the supply chain. AI, ML, Predictive Analytics — software that allows companies to find insights and derive predictive analytics such as when machines will need maintenance. Most companies in the category are like Maana and work by applying AI to mining machine data, but others, like Augury Systems, offer a full sensor suite that detects machine anomalies and offers predictive analytics. Cybersecurity — companies in this category develop cybersecurity solutions for IIoT and industrial control systems (ICS) in heavy industry. The IIoT has already suffered serious hacks; a German steel mill suffered “massive damages” after hackers accessed a blast furnace that workers could not properly shut down. Bastille Networks is one company that focuses on protecting the wireless transmission of IoT and RFID devices, and Claroty is a well-funded company working on protecting industrial control systems. Startups working on industrial sensor networks have potential to revolutionize manufacturing, logistics, and energy, just to name a few areas. Look for IIoT in the Collections tab. Want more data about top Internet of Things (IoT) companies? Login to CB Insights or sign up for free below. 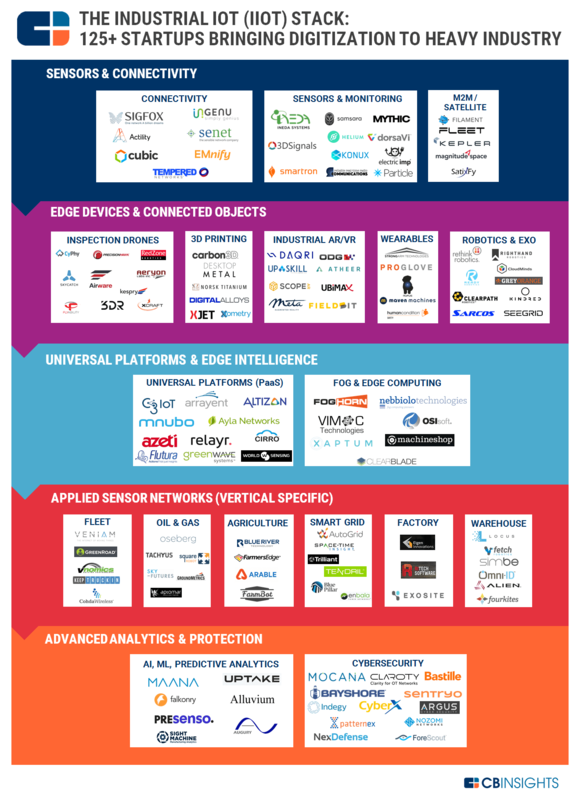 Good collection of IIOT startups.